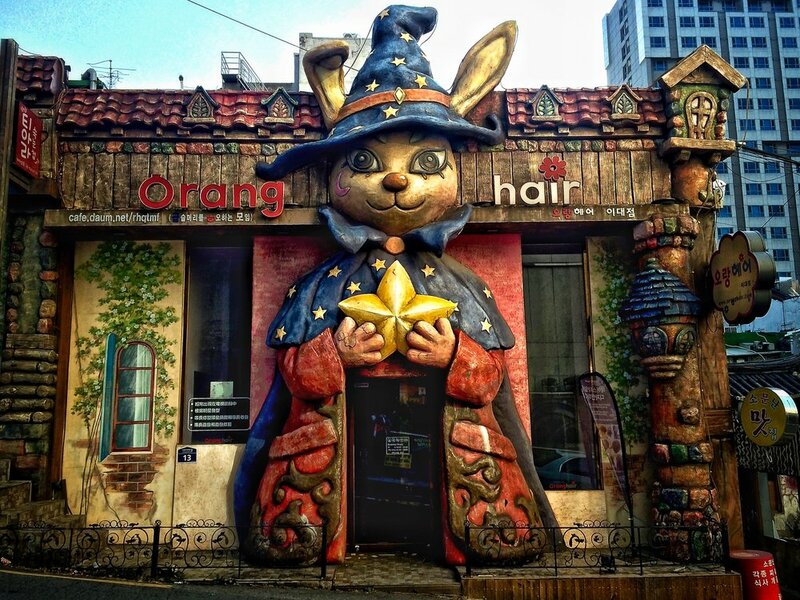 I’d like to think the owner of this hair salon in Seoul decided to put up a giant hare over the door because it’s a hair salon. Hare. Hair. It’s magically Korean for sure. It’s web address is just as puzzling as the decision to make this the entrance to a hair dresser. It got me on the homepage of Orang Hair. I did not see that coming. Turns out daum.net is just a Korean web portal like your AOL.com (ha!) that’s been around since 1997. At least we’re clear on that. Orang Hair does, however, offer to perm you hair into some hip waves. Waves aren’t curls. But wait, it gets better. Razor sharp research on my part reveals: Orang Hair is actually Korea’s largest curly hair magic shop. What a ‘curly hair magic shop’ is, is not important right now. What matters is that Orang Hair rules that field, meaning the statement on its homepage about hating curly hair might be deeply ironic. No. Hold on. Further research reveals: Orang Hair is very committed to the hatred of curly hair. The ‘magic’ in their claim to be Korea’s largest curly hair magic shop means Orang Hair will let your natural curls magically disappear. They’ve got Before and After photos and everything. Why am I only finding out about this now? Should’ve passed through those hare’s legs and discover the deep hatred Orang Hair would showcase regarding my own curly hare. Hair. And then let Orang Hair go to town on it. But I didn’t go in. I got distracted by this giant Bowling Pin further down the street.